Music is a vital part of human culture. It’s how stories are told, it’s a powerful way to express emotions, and can be how we tell someone we love them. Music can be calming, energizing, spirit lifting and concentration inducing. Studies show that certain types of music can stimulate parts of the brain responsible for expressive language, problem solving, and improved memory. In babies, music has a profound effect on learning and development in a broad range of critical areas, which is why it is important that your child experiences music as young as possible. When my daughter was first born, I would sing her to sleep every night and it was one of the only things that would calm her down and soothe her to sleep. 8 months later, I sing her the same lullabies and she tries to sing along. Babies often begin developing language by babbling in long drawn out musical tunes. When a child sings, key areas of the brain related with output and input of speech engage. As a result, it is not surprising that studies show that babies who engage in music frequently are likely to speak earlier in life. The more she engages with the music, by moving to the rhythm or by playing simple instruments (e.g., drums or maracas) the bigger the benefits on this area. The cognitive benefits of music are multiple. It provides a channel for children to learn basic concepts in an entertaining fashion. Think about songs like “Head, Shoulders, Knees, and Toes,” which teaches children the parts of their body while they are dancing or “Old McDonald,” which helps them to learn animal sounds. Playing with instruments is a great way to introduce the concept of cause and effect while experiencing music. Your baby can play along to the music or create their own, all while developing an understanding of sound, pitch, tone, and rhythm. Music helps strengthen neural pathways in the brain responsible for learning and memory. Babies as young as 6 months old can recognize a tune they’ve heard two weeks before. It also helps develop problem-solving skills. Clapping to the beat and dancing to music adds a physical element. It helps children learn rhythm and body awareness while exercising. Songs with sequential dance moves like the Macarena teach children coordination and timing. Performing the hand gestures for the Itsy Bitsy Spider helps children develop coordination and fine motor skills. 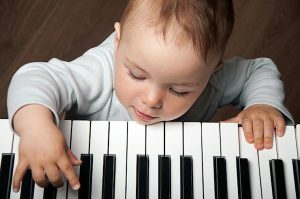 When they are older, learning to play an instrument continues to provide similar motor benefits. Singing, clapping, dancing or simply enjoying music with your baby will likely turn into a fun and bonding experience. In different studies with mice and humans, researchers have discovered that singing and listening to music resulted in higher oxytocin levels in the body. Oxytocin is a neuropeptide released during breastfeeding often called the “bonding” hormone as it serves as a catalyst for increased trust and bonding between people. Because music is so significant to development, it is important to nurture your baby’s natural curiosity and enthusiasm towards it. Most often, classical music is suggested due to its intricate compositions and the variety of instruments that it incorporates. However, any music will work as long as you experience it together. Remember that babies learn from their environment and take cues from their parents, so play, clap and sing with your baby. And don’t worry, your baby won’t notice if you don’t have a great voice.